The project has now finished, please download the project closure letter for final details. The coastal frontage at Royal Victoria Country Park is protected by a sea wall, over recent years a number of weaknesses have been identified including voids behind the wall, bulges in the sheet piling and corrosion of the wall. This has meant that the footway along the top of the wall has been shut since 2006 due to safety concerns. Although the County Council has and continues to undertake maintenance work it’s thought that the sea wall has reached the end of its design life and ongoing maintenance will not be sustainable. Replacing the seawall would be extremely expensive and may not be in the public interest and may impact on wildlife. If the seawall were removed and the shoreline returned to a natural coastline there would be implications for the main vehicular access to the park and the private residences, and risk of pollution from the main sewer which runs behind the seawall. The entrance to the park occasionally floods and there may be an increase in future flooding of the main vehicular access point to the Country Park in the future as sea levels rise and storm surges increase. Raise awareness of the coastal defence issues and the limitations of funding. Produce a short term flood risk plan for the Country Park. Produce an action plan to aid Hampshire County Council’s long term planning for the Country Park. How is the coastline at Royal Victoria Country Park changing? How will this affect the park, residents, business and visitors? What can be done to minimise the potential detrimental effects e.g. options for the seawall and alternative access? What do the community want from the park in the future? The project will not be able to fund any coastal defence scheme for the park or the Netley frontage. The project will help the community understand the coastal defence and cost issues affecting the Country Park and give the community an opportunity to influence short, medium and long term planning for coastal defence of and access to the park. Continuing erosion of the seawall and flooding of the main vehicular access point. Public concerns regarding the on-going closure of the seawall footpath. Possible loss of the road within the Park due to failure of the seawall could impact on access and use of the Country Park and other residences and business, and on the main sewer. Various constraints to consider e.g. costs of any works, how to divert vehicular access, environmental sensitivity and designations, impacts on wildlife, consents and permissions. What happens in an emergency (i.e. where is the alternative access to the Country Park when the current access point floods, possible pollution, and safety of foreshore area). A Local Engagement Group, which includes around 10 local community representatives, has met to help the project team determine how best to engage the wider community in the project and has helped develop a Stakeholder Engagement Strategy, a leaflet, exhibition material and the workshop process. A number of workshops were held with community members to consider the issues. During the workshops participants were asked to consider how the area has changed over time and will continue to do so in the future by discussing their memories of the Park; how they value the Park currently, and what they would like to see in the future. Since workshop 3 a draft Adaption Plan has been shared with the community. The project has now come to a close, and a letter has been sent to the project, explaining how the work of the project will now be assimilated in the future work of Hampshire County Council. Download project closure letter. It should be noted that there is no consensus on what the community believes should be the response to the end of the sea wall's design life. For each of these the various constraints are considered such as costs and other resource implications, technical feasibility and other practical considerations, environmental impact/opportunity, permissions, timescale and what other information is required. The best option seems to be a step change approach with short, medium and long-term solutions being adopted. The community were open to taking a combination approach to the options as steps to a longer-term adaptation plan. This plan links closely to the Royal Victoria Country Park’s emergency plan so that it is clear to all what steps would be taken in the event of a catastrophic collapse of the wall caused by extreme weather or structural failure. Download the draft plan - RVCP Adaptation Plan Draft, Jan 2014. 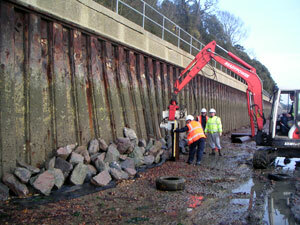 The results of the work will be taken forward by Hampshire County Council in determining the future of the seawall. The challenge is that there remains little consensus over a solution and any solution has numerous constraints.